ESTERO, Fla. - The Florida Everblades will host the Greenville Swamp Rabbits this Saturday for their annual Teddy Bear Toss presented by Florida Community Bank, a night that will also feature a postgame jersey auction to benefit the Animal Refuge Center. Having donated over 100,000 stuffed animals to local charities over the lifetime of the promotion, the Everblades will seek to surpass the total of more than 8,100 teddy bears donated at last season's event. "Teddy Bear Toss is such a special community event, and we're thrilled that the support for it continues to grow year after year," said Chris Palin, the Everblades Executive Vice President of Business Development. "We're grateful to have Florida Community Bank as the presenting sponsor for Teddy Bear Toss, and we're excited to team up with the Animal Refuge Center for a postgame jersey auction to make the night even more interactive this year." Fans are asked to bring a new teddy bear or stuffed animal to Saturday's game. 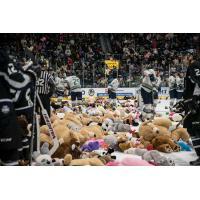 When the Everblades score their first goal, fans should toss the teddy bears out onto the ice to celebrate. The teddy bears and stuffed animals will then be collected and distributed to local children's charities across Southwest Florida for the holiday season, including the Golisano Children's Hospital. The 'Blades will wear custom teddy bear-style jerseys on Saturday night, which will be auctioned off live after the game. Proceeds from the jersey auction will benefit the Animal Refuge Center. "ARC is thrilled with the opportunity to partner with the 'Blades, which will help hundreds of pets skate towards a brighter future," said Betty Hughes, the Board Treasurer for Animal Refuge Center. "We look forward to the Teddy Bear Toss game as well as the auctioning of team jerseys after the game. The proceeds from these specially designed jerseys for ARC will help us give that extra 'paw up' to homeless pets in Southwest Florida that turn to us for help." Doors will open at 5:30 p.m. on Saturday and fans are encouraged to arrive early to ensure they are seated in time for the 7 p.m. start to take part in the celebration when Florida scores its first goal of the game. Saturday's game will also feature a pregame tailgate from 5-7 p.m. that will take place outside of the arena. The tailgate will include live music from Charlie Moon and bounce houses for kids. The Coca-Cola Caravan will also be in town, and fans will have the opportunity to take free photos with Santa. Prior to Teddy Bear Toss on Saturday, the Everblades start the two-game series with Greenville with a 7:30 p.m. matchup on Friday at Hertz Arena. Kids can eat free in the Breakaway Sports Pub on Friday with the purchase of an adult entrée, and it's also a Bottomless Popcorn Friday. Fans can purchase $2 End Zone tickets on Friday by showing a Wendy's Frosty Key Tag at the Florida Community Bank Box Office.